T4G 2018 is now history. CJ Mahaney, undoubtedly under pressure from his gospelly buddies, once again withdrew from the conference, just as he was forced to do in 2014. 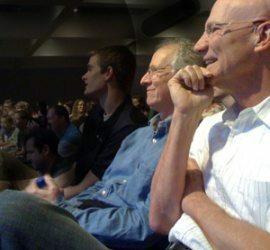 It appears the T4G crew learned something from their 2014 public relations disaster – Mahaney was not only not sitting in the front row, he was nowhere to be seen. His Twitter feed also went silent. Taking Mahaney’s spot on the stage was H.B. Charles. Let’s hope the change is permanent! How many of you remember Carl Trueman’s challenge to the T4G celebrities at the 2012 conference? (Listen to the audio excerpt below.) He was on a panel discussing celebrity Christian conference speakers. Trueman chided the T4G regulars for having the same dozen speakers at every conference. “Very helpful, very helpful, that’s good,” said panel moderator Ligon Duncan. Duncan’s comments proved to be mere lip service to the credible charges leveled by Trueman. Six years and three conferences later the only discernible difference seems to be the appearance of Charles to replace Mahaney, and the disappearance of Trueman. John MacArthur at the 2016 T4G conference, surrounded by his worshippers. As I once again observed the T4G conference from the comfort of my study and read through the many Tweets, I was stunned by the over-the-top outpouring of adulation for the main speakers. I believe it’s not only unhealthy, it is idolatry. I would think these wise and humble leaders would discourage this type of behavior, but quite the opposite seems to be the case. Official T4G sites on the web were full of “action shots” of the celebrities as they spoke from the stage. 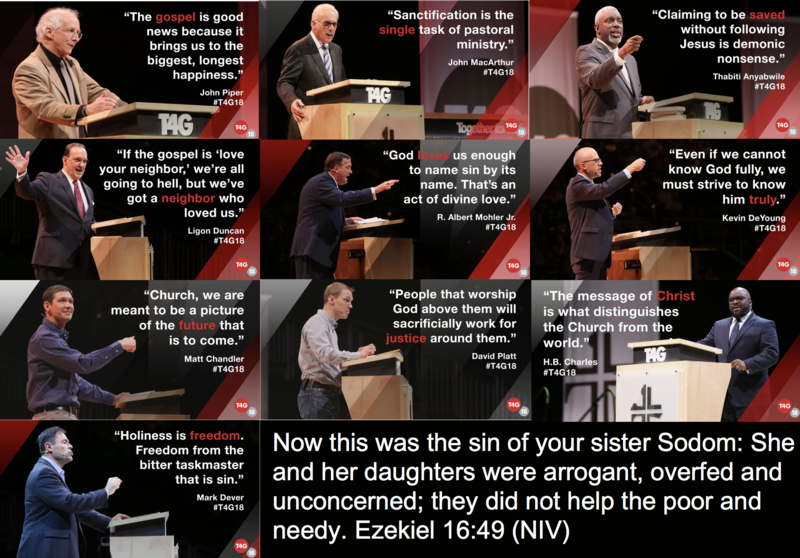 The T4G web page has a photo of each plenary speaker along with what they feel was a life-altering quote accompanying the photo. I also noticed several of the speakers played up to the social media phenomenon of the masses Tweeting out their favorite speaker’s pithy one-liners. If the speaker thought he had crafted a particularly fine line suitable for retweeting he would often say “let me repeat that,” and then restate the line at a slower speed with greater emphasis. This would cause even the dullest wits in the audience to sit up and write the gem down. The speakers themselves were quick to point out how great their fellow speakers were, both from the platform and on their Twitter accounts. The thought occurred to me that what takes place at T4G is the same thing I engaged in when I was a youngster. I, along with my brothers and our neighborhood friends all loved baseball and we collected baseball cards of our favorite players. We would spend our money earned from delivering newspapers on packs of baseball cards. 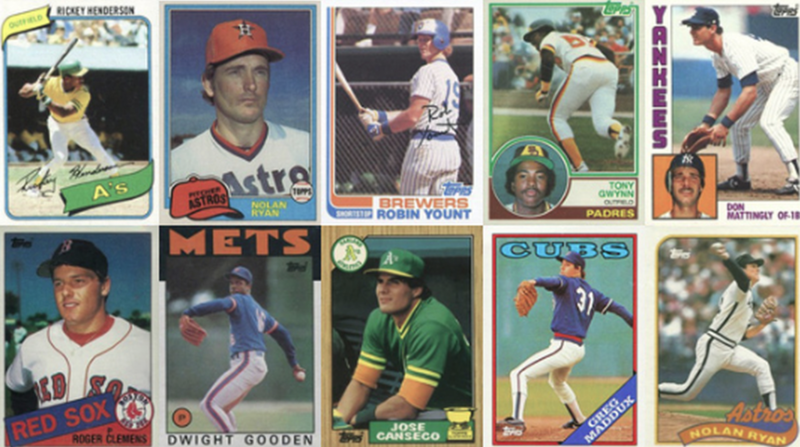 One pack would contain a piece of bubblegum and several cards of different players in various poses. We would then trade cards with each other, hoping to get rid of cards we had doubles of for a player we idolized. The back of the cards contained a brief comment about the player along with his career stats. Most of us have put away childish things, but it appears that many at T4G have simply exchanged the worship of sports stars for the worship of pastors. 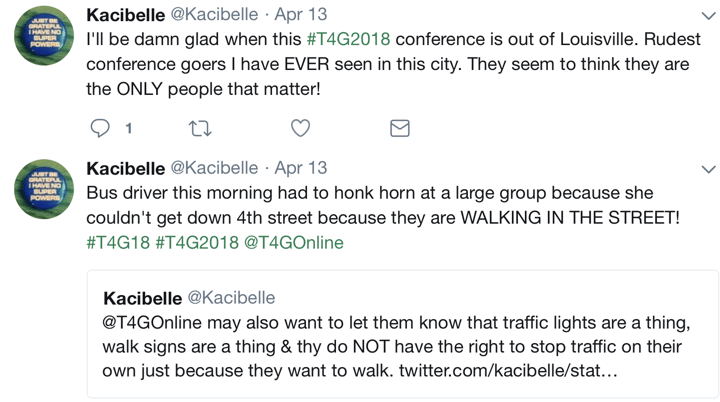 Before I get into my critique of the speakers, I thought it would be interesting to see what the citizens of Louisville have to say about the T4G conference goers. It seems they aren’t enamored with them. Even some of their own crowd chided them for their cheap ways. Also, I wanted to offer a hat tip to Deana Holmes. She is a strong advocate for those who have been abused. She flew from Phoenix to Lousiville on her own dime and her own time to protest the coddling of C.J. Mahaney and the continued presence of several Sovereign Grace Churches leaders who played an active part in the conference. Below are some excerpts from a few of the plenary speakers. Obviously, I have not covered every speaker, nor everything a featured speaker said. I would encourage those of you who think I am being unfair to start your own blog, and then you will be able to portray your idol in a more favorable light. Leading off is a short clip from Mark Dever. Any guess what he might be talking about? If you guessed church discipline that would be a pretty safe guess, and it would be correct. Next is Thabiti Anyabwile. He does his best to silence all the critics like me who dare question him or any of the other T4G speakers on social media. We are scoffers. He went on to criticize anyone who retweets any comments which have originated from a scoffer. This is just another hypocritical cheap shot against bloggers who oppose the celebrity speakers. Truth be told, Thabiti has a much larger presence on the internet than most bloggers I know and judging by his numerous Twitter conversations after his article on MLK, plus several articles he posted after that article attempting to salvage his name, he seems to really enjoy camping. Finally, he makes the bold statement that “these are unsaved people pretending to be Christians.” It appears Anyabwile is saying that a blogger who dares question a T4G speaker’s views of the Bible is a scoffer and thus not a Christian. Did Anyabwile just scoff at those he labels scoffers? Is he pretending to be a Christian? This is a tactic often used by those in power to silence their critics. It generally works pretty well, if not to actually silence those who dare question the leader, it at least makes many weaker individuals sit down and shut up. You may recall I wrote about CJ Mahaney doing the same thing to his congregants shortly after the 2016 T4G conference. You can view that blog article here. For a display of scoffing, I recommend you view a discussion Phil Johnson, James White, and Thabiti Anyabwile were having concerning an article Anyabwile wrote about the assassination of Dr. Martin Luther King. Anyabwile stated that white Americans were complicit in the murder of MLK. You can view my blog on the subject here. Johnson and White both challenged Anyabwile’s charge. Anyabwile responded to a comment Phil Johnson made in what I would label a scoffing manner, stating that Johnson didn’t understand the Gospel! Speck and plank, Thabiti? Next, I have a segment from Albert Mohler. The blatant hypocrisy of his statement is stunning. “Sin tolerated in the church is a disaster to the church and to the gospel and to the reputation of Christ.” Mohler has tolerated, indeed abated CJ Mahaney for years. He was quick to go after Penn State for the sexual abuse scandal and cover-up, but when it was revealed shortly thereafter that his good friend CJ Mahaney had done the exact same thing, Mohler said nothing for months, then produced a statement which contained lies, signed by himself, Mark Dever and Ligon Duncan. They were called out on this so they changed the statement and reposted it without commenting that they had changed it. Mohler then did everything he could to help Mahaney get back on the conference circuit, and while introducing Mahaney prior to his speech at the T4G 2016 conference, made a tasteless joke about the information one could find about Mahaney on the internet. Although Mahaney was pressured to withdraw once again from this year’s T4G conference, it is clear the T4G leaders are still tolerating the sins of Sovereign Grace Churches. 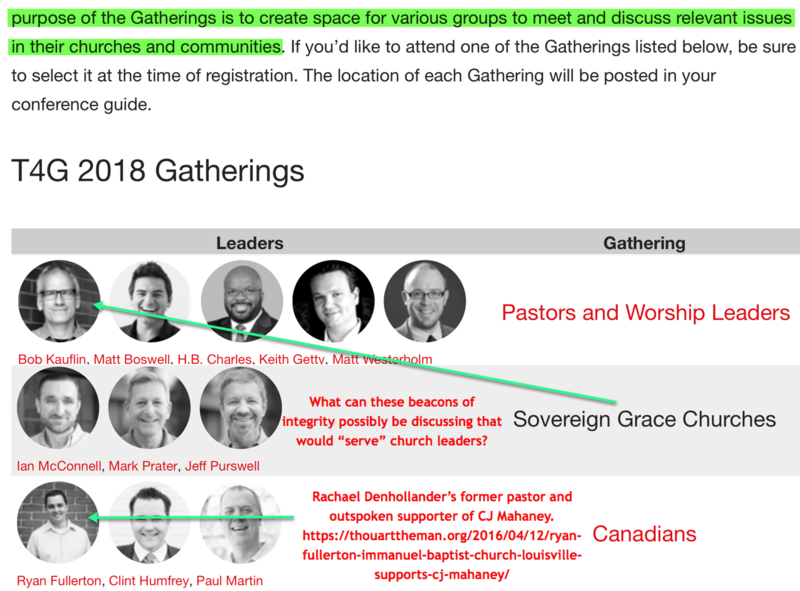 Below I have highlighted prominent Sovereign Grace leaders who took part in T4G 2018. The last speaker I will feature is David Platt. He spoke about racial injustice. His speech created a huge amount of comments on Twitter. I won’t say much about that except to acknowledge that I agree with what Platt said in the clip below. Racial injustice needs to be addressed by the church, that said, I can’t help but wonder when T4G will address the injustice perpetrated upon the victims of sexual abuse. Although the Sovereign Grace scandal is the obvious elephant in the room, I actually believe Boz Tchividjian was correct when he stated several years ago that sexual abuse in the Protestant Church is worse than in the Roman Catholic Church. Sexual abuse scandals seem to be breaking weekly in the Evangelical world. But if you want to address racism in the church, I would suggest one should start right there in Louisville, on the SBTS campus, the seminary that trains so many of the young Baptists desiring to become pastors. Did you know that Boyce College, the college affiliated with SBTS, is named after James P. Boyce? Boyce was the founder of SBTS. Read the quote below. Here is a photo of Al Mohler and Rick Holland at the gravesite of James P. Boyce. Guess who the chapel at SBTS is named after? Yep, Captain John Broadus! It seems clear to me that T4G has plenty of reconciling to do. 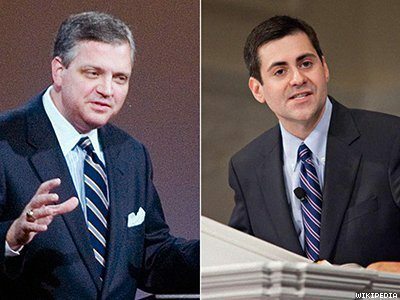 For the celebrity leaders to stand up and point out the racism problems in the church at large when Al Mohler and SBTS appear to me to have a huge problem of their own is hypocritical. The same goes for Mohler calling out Penn State for covering up sexual abuse while still allowing Sovereign Grace leaders to have a role in the latest T4G conference. 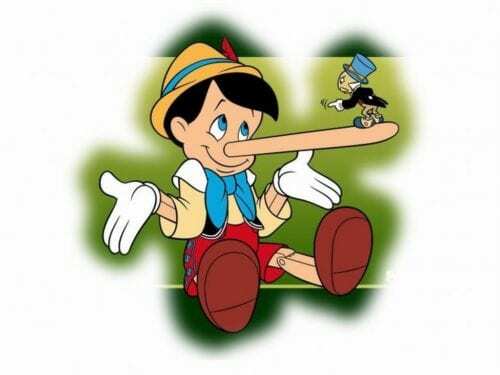 But hey, what do I know, I am just a scoffer! I have read the posts regarding the speakers for T4G 2018 and am amazed at the petty sniping and general negativity on display.The point and relevancy of conference has been reduced to ‘tipping’ or otherwise of hotel/restaurant staff. The Devil is active among you all. In my view, the point and relevancy of this conference is idolizing corrupt Pastors who are laughing all the way to the bank. John MacArthur, for example, makes more than $400,000 working part-time for a Christian non-profit. But seriously, per its comment policy, this blog doesn’t normally post petty insults, like yours, that are not backed up by intelligent reasoning or credible sources. Please invest a little more energy and thought in any other comments you submit. If you just want to lob insults at people you don’t agree with, there are plenty of other blogs that will welcome that level of diagolue. P.S. – you might to read some articles about how T4G speakers enable child sexual abuse. and am amazed at the petty sniping and general negativity on display. I am not amazed by the petty sniping and general negativity you have displayed. Defenders of T4G’s so-called celebrity Pastors seldom take the time to research claims made by people who don’t idolize these men in a cult-like fashion. Nor am I surprised that the supposedly Godly, complementarian men of T4G have sent another woman out to defend them. They have ya’ll doing all the dirty work while they preen onstage. per this document from the U.S. Labor Department. Per the document above, in theory, food service employers must guarantee that food servers receive the minimum wage of $7.25/hour. 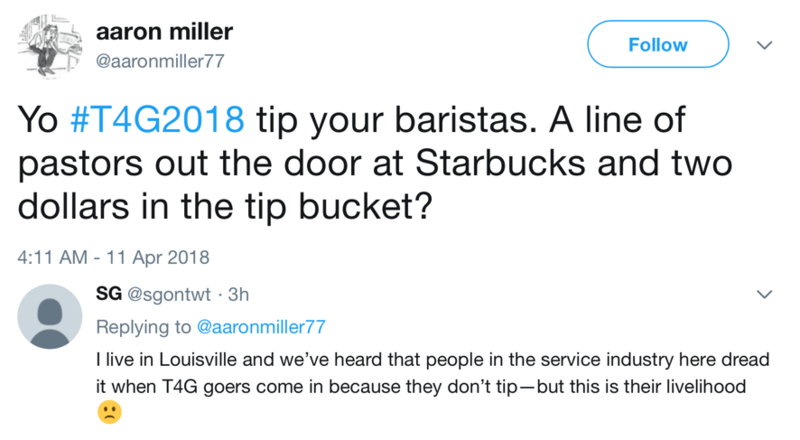 That means that if 12 T4G Pastor attendees take up an hour of a food server’s time in Louisville, Kentucky and don’t leave a tip, that person is paid $7.25 an hour at most. Here’s the kicker, many businesses don’t follow any number of labor laws, especially if they’re employing marginalized workers who aren’t entitled to more than the $7.25/hour minimum wage in Louisville, Kentucky. Such people can’t afford to hire lawyers who will sue a company on their behalf. I know this because I have worked in many low-paying jobs in the service industry, in which employees, including me, were regularly cheated out of wages and benefits. So the unfortunate un-tipped food servers who waited on T4G attendees, may not be able to recover the additional $5.12 they are owed by their food service employers. In theory, not tipping a food server in Louisville, Kentucky could mean that that person was only paid $2.13 an hour. In T4G’s case, many of their attendees seem to eat in groups, so it’s entirely possible that the whole group took up a full hour of a food server’s time and didn’t leave that person a dime. As to to the idea that T4G’s attendees are too cash-strapped to tip, here’s what I know. Many food servers often make little more than minimum wage, and they usually have children and other family members to care for. T4G offers no scholarships or financial aid. The minimum fee for attendance is $99 for students. It’s $200-$250 for non-students. Very few food servers could afford to even attend this conference. The T4G attendees all had at least $99-$250 of spare cash to spend attending a conference. In addition, many, if not most, of the Pastors attending T4G, are doing so on their Church’s dime. The Church pays for their airfare, conference fees, meals, and other expenses. I don’t know how much these T4G Pastor attendees are paid, yet I think it’s usually more than $7.25/hour. I believe that the behavior of such T4G Pastor attendees is an embarrassment to Christianity, as is your defense of them. I doubt that we’ll be hearing from Carol, again. She just didn’t needed to let us know that the devil is among those of us who don’t appreciate Together For the Gospel’s supposed finer qualities, which she did elaborate upon. If T4G serves a purpose besides glorifying rich Pastors, I’d love to hear more about it. I don’t feel better. Folks like Carol often think that I get a kick out of calling out Evangelical Pastors for boorish, unethical, or even illegal behavior. That’s incorrect. Pastors who don’t tip food servers or enable child sexual abuse embarrass me as a Christian even if I’m not part of their direct Christian community. And no, I am not equating being stingy with food servers with enabling pedophilia. Unfortunately, some of the T4G attendees in 2018 probably do both. You’re good at getting after me for stereotyping people inappropriately, Lydia. That’s a good thing. However, I’m going to generalize for what I hope is a good purpose my friend. If these T4G conference attendees, who are Pastors, were in a liberal area like Berkeley, California, perhaps we could argue that people didn’t like them because they were Evangelicals in an area with relatively few Evangelicals. However, the last time I checked Louisville, Kentucky was considered the mother ship of the American Evangelical world. The greater Louisville area is reputedly home to more than 3000 Evangelical Churches. That seems sad and reflective of my perception that T4G has nothing to do with glorifying God or being a good Christian witness. That was interesting to hear the Mark Dever video. Dever said that if you don’t have church discipline you will have hypocrisy. The only problem is that leaders like Dever only apply church discipline to regular members and not leaders. In fact they do have hypocrisy in their group because they didn’t apply church discipline to C.J. Mahaney. Amen! Dever’s church members have to sign contracts, but he and other Pastors do not. What does that tell us? That Pastors are not accountable to anyone? While I would agree that hero worship, and yes, idolatry can easily be a pitfall for those within the New Calvinist movement. Is there any other movement (Christian or otherwise) that was not headed by a prominent single individual or small council of leaders? Is there any other movement where the followers were not tempted to hero worship? I would suggest that any successful movement has these individuals who are representatives, drivers, and “heroes”of the movement itself. Those who are not in these leadership roles would certainly look to the leaders for guidance. This can (and should) be done without worship. What are your thoughts? Thanks for your comment. I’m a little confused. Did anyone here suggest that Neo-Calvinism was specifically behind any perceived philosophical/theological problems or boorish behavior regarding this conference? Human nature being what it is, you are probably correct. I cannot think of any movement, in the world, nor in the church where there this has not existed. That said, I submit that Christianity should be different. I have actually seen a Christian leader who was obviously uncomfortable with receiving a standing ovation and when the people sat down the man tactfully told them that while he appreciated their show of affection, all glory is to go to God, not a man. I have not seen any similar action taken by the T4G celebrities, instead, as I stated in my article, they encourage audience adulation by their actions. I think that unfortunately, large-scale conferences contribute to this worship of man. These conferences are largely a modern day phenomena which, due to the large amount of money they generate, will probably not disappear anytime soon. They decided that Barnabas was the Greek god Zeus and that Paul was Hermes, since he was the chief speaker. Now the temple of Zeus was located just outside the town. So the priest of the temple and the crowd brought bulls and wreaths of flowers to the town gates, and they prepared to offer sacrifices to the apostles. While the T4G crowd has not reached this level of craziness, many of them are wildly devoted to their favorite celebrities. It’s past time for one of the celebrities to deliver to the adoring masses a message similar to Paul’s. In Mark 10, James and John are desiring and seeking the status of 2nd and 3rd greatest in glory. Rightfully so, the ten are indignant. And Jesus rebukes them to not flaunt authority but to lead by serving. I do not believe that it is fair to say that any of these conference leaders are desiring this worship, these are pastors grounded by their depth of depravity (save for some personal sanctification maybe going on within them). On the contrary, it seems God has granted them gifts of communication and positions in which to serve by exercising those gifts fully (think the faithfulness of the first two servants even with different levels of responsibility in Matt 25:14-30). I’m an engineer, not a writer, but Ill be so bold as to suggest your next post should be a letter explicitly to Together for the Gospel, calling the leaders to exhort their listeners to take a step back and lift their praise to YHWH and not MD, KD, JP, JM, AM, TA, LD, or HBC, to consider a rotational lineup (for the benefit of T4G, the new additions, and the church as a whole), and to charge those who attend to show gratitude to the hospitality of Louisville, as a way to live out the Gospel being taught at the conference. I think a critique, yes, even a scoffer’s critique, is always more well received when it not only identifies problems, but proposes solutions as well. Thanks for your suggestion on my next post, Ben. But I will not be writing to T4G leadership anytime soon. They aren’t real receptive to rock-throwing peasants such as I. Brent Detwiler, at one time the number two man in the Sovereign Grace denomination, has written them all two or three times and to my knowledge, they never responded. So there is probably little chance of them responding to me. Several of them have blocked me on Twitter. I sent 12 of them the book “Betrayal: The Crisis in the Catholic Church: The findings of the investigation that inspired the major motion picture Spotlight” ( https://www.amazon.com/Betrayal-Catholic-findings-investigation-Spotlight-ebook/dp/B001MT5NSC/ref=sr_1_1?s=books&ie=UTF8&qid=1524367371&sr=1-1&keywords=spotlight+boston+globe ) for Christmas, 2016 and did not receive a single thank you! I have had other people advise me similarly to what you have said to make my message better received. Perhaps you’re right, but it’s not my style. My message resonates with some, not with others. That’s O.K. with me. I placed the M.L. Jones quote under my blog title because it represents how I feel about this matter. Thanks for your comments Ben, you seem like a good man. There is certainly no benefit to anything along the lines of “I love everything about what you just did, except for Exhibit A, which was great, but maybe could’ve been done differently”. That’s definitely not speaking the truth in love. I would say that the truth in love is both descriptive of the problem and prescriptive of the solution. I can think of no one better at describing and prescribing the truth in love than Jesus. Leading through serving because Jesus led through serving, even to the point of laying his life down for his sheep. So, speaking the truth in love, I would suggest that your critiques are not complete without proposed solutions. Why? Because Christ critiqued by describing the issue and prescribing the solution. We, as brothers and sisters in Christ, are not to use our fingers to merely point out the specks and logs in each other’s eyes, but to actively pull the debris out, for the sanctification of our brother/sister and glory of God. I hope you’ve read this comment chain, because I’m trying to keep everything on one thread. If you’re listening to these sermons, you can hear that not one single sentence is meant to showcase that pastor’s righteousness. Instead you hear about the intricacies of the unchangeable character of God, the urgent importance of loving our neighbors as ourselves, a call for justice, and a caution to be wary of scoffers (not critics, as I would categorize you as a critic, and those who mock the very idea of salvation through Jesus and holy living in response to Christ as scoffers), to name a few. The only proper response to these is praise to God, not the speaker, whether through sheer awe or obedience. Pastoral worship is not the goal of any man behind that podium. However, this is a fallen world, idolatry does exist. What a shame that some will hear words that convey the living God and his will in incredible ways, only to close their ears and fix their eyes on the man from where the words come. As to being unable to see evidence that T4G leaders are motivated by religious beliefs, please see the list in the preceding paragraph. These sermons could only have come from religious beliefs. There are far easier topics to cover if these pastor’s wanted to advance their own righteousness. The Gospel that is proclaimed at T4G, that God created man in his own image, that one man sinned and marred mankind, that we are all sinful by nature and are deserving of hell, that one man, Jesus came, lived the life we could not live, died the death we should have died, conquered death and sin, and is in heaven interceding for us even now, that we only need to believe that we cannot enter heaven on our support because of our sin and that Jesus became sin so that we might become the righteousness of God, that God’s original purpose for us is restored through Christ alone, is great, glorious news, but terrible business. Pointing out people’s need for a savior is terrible for business. Man wants to be told that they’re okay, that Jesus is fine with them the way they are, no change necessary. Man wants to be told that they have been good enough, that they deserve salvation. The depth of our sin and the height of God’s holiness, does not a bestseller make. Hearing the pure zeal, urgency, and joy in the sermons of the T4G leaders, I can confidently say that I see no evidence that T4G’s so called celebrities are business people in the “God business”. Rather, they are just God’s chosen messengers motivated by the Word and Spirit of God. Hi Ben. I look at how these Pastors slander sexual abuse victims, not what they say in their sermons. There’s a big disjoint between what they preach to adoring audiences and how they live their lives. Any wolf in sheep’s clothing can preach a nice sermon. You’re welcome to keep commenting, yet probably I’ve said my peace. I want to focus on victims not corrupt, swarmy Pastors. The proposed solution, by many, has been that people boycott this conference, as it serves no purpose other than praising Pastors not God. T4G did sell out, but it took them 5.5 weeks longer in 2018 to do so than it did in 2016. That’s progress. As Todd mentioned, the bigwigs have refused to publicly answer critiques of any kind. Burying their heads in the sand is their solution to criticism. The news at Sovereign Grace is relatively new to me, having lived in small town Mississippi when the events took place. Could you please help me with any resources where the pastors who spoke at T4G verbally attacked a sexual abuse victim? These Pastors didn’t publicly verbally attack anyone, although I am aware that they have done so privately because I interact with victims. For CJ Mahaney’s benefit, they publicly published several statements that slandered victims, in my view, because they contained glaring factual errors designed to undermine the cases of victims. After they were embarrassed by the factual errors in one statement, which revealed that they had not even read the lawsuit they were critiquing, they amended it without notice. These statements were also put in places where people could not comment on them after these supposedly complementarian, manly Pastors received some feedback on Facebook that they couldn’t handle emotionally. With one possible exception, they did all this without reaching out to any of these victims, several of whose stories were already backed up by criminal convictions. Since, the statements were published, more stories have been backed up by criminal convictions. I could point you directly to the documents I’m referencing. They aren’t hidden. However, if you’re new to the SGM awfulness, I suggest that you do some Google searches first. You’ll understandably trust your own research more than you’ll trust me. 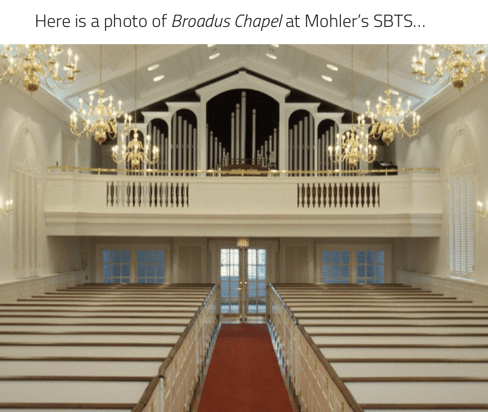 Todd, a good friend of mine who I haven’t seen in a long time used to always refer to Southern Baptist Theological Seminary as Southern Baptist Theological Cemetery. After reading all this, I have to laugh. When the Neo Cal movement got rolling here at ground zero, the big theme was “going back to our roots’ as if the ‘True Gospel’ resided there. Going back to a time Baptists split over taking slaves on the mission field because the SBC was Calvinist! As a lover of history, I was shocked at how blind that motto was. It was no secret that many wrestled with the fact that God was not on their side after the war and there was a painful, slow evolution for many (not all) to free will in the SBC over the subsequent decades. Harriet Beecher Stowe wrestled with her Calvinism, in addition to slavery. It is a carefully inserted underlying theme in her not well known book, “Ministers Wooing”. A lot of people also do not know that her father was put through a grueling ecclesiastical Court trial over a point of doctrine. Nasty stuff back then. So the “roots” focus at SBTS was astonishing. If you want to be even more appalled you can read Broadus’ bio of Boyce. He pretty much lays it out that God brought slaves here for them to convert. It was all “God determined” and they were His servants preaching to slaves. The “Going back to roots” was an eventual disaster because of social media. The insulated and isolated leaders led many young men right off an inexplicable cliff. That is one reason why I think they have become such dogmatic social justice warriors– to rehab that unfortunate focus and image. It’s no longer doctrine as the main focus but social justice. This was also the trajectory of the descendants of the Puritans and Main lines, years ago. History repeats itself. As to T4G descending on Louisville, the tourism folks are happy. The hotels are happy but the servers are not. Its not a secret. My philosophy is that if you can’t afford to tip the servers, maids, etc, don’t make the trip. However, my guess is every young man is saving every penny to buy books. My step dad was asked to put up an attendee years ago by a young family friend. My stepfather was no fan of Al Mohler, he barely tolerated him, but a kind and generous man who opened his home. But he was absolutely appalled that this young man, married with a child, spent his money on driving hundreds of miles to a conference when he could barely afford food or gas and had a family. He fed him and even gave him money for gas on the way home. But I am sure the young man received a bit of a lecture about putting his family first. 🙂 There is a cultic aspect to that sort of devotion. Most of the Pastors are white and many of the food severs are likely not white. So Pastors at this particular conference are shedding tears about MLK’s assassination and racial injustice while stiffing non whites on tips. It doesn’t get much more classless and hypocritical than that. Janna, You might be surprised when it comes to area restaurants downtown it’s not really broken down into such stark categories. Some of the popular metro foodies are AA owners/chefs. Most hotels outsource catering staff for “events”. It’s all partime serving work with no tipping. Like banquets. You are correct, Lydia, I don’t know very much about downtown Louisville and am stereotyping aspects of it. But for a good purpose, I hope. I’m bringing up a socio-economic issue that should be discussed, in my view, even though I have never been to the city I’m talking about. I am assuming that in instances in which tipping would be expected, not all the food servers are white in Louisville, Kentucky. I do know that the majority of T4G attendees are white. In many major U.S. cities, a large percentage of food servers, who should be tipped, are not white. Louisville is also in an area that has experienced violent racial strife in the past. People in Denver, Colorado might be racist but there was never a Klu Klux Klan lynching in Denver, to my knowledge. Therefore, all people in Louisville should be especially sensitive about real or legitimately perceived racial discrimination in Louisville, Kentucky, in my view, during a large event in which the attendees are claiming to have high moral standards. It would also still be classless and unwise not to tip white servers, in my view. These Pastors are claiming to represent the Gospel after all. They don’t even have to leave a large tip but not tipping at all is wrong given that food servers are not even paid minimum wage in the U.S. and the American attendees know that. Also, I haven’t been a food server per se, but have worked many difficult service jobs including cashiering at a gas station next to a liquor store. I often tip even when it isn’t expected, because I know how hard it is to serve the public for little money and no health insurance. By contrast, has Al Mohler ever done anything but give lectures to adoring crowds in air conditioned conference halls or Churches? Has Mahaney or Dever? If so, they don’t talk much about their days making an honest living for low pay and zero status. I think that behavior is ignoble and not aligned with the Christian tradition of caring for people in need. And at this conference which discussed MLK’s violent death, I hope I’m wrong. As a tribute to MLK’s life philosophy which included general socio economuc injustice, I hope that these T4G Pastors demonstrated that that wasn’t just talk by tipping people when they should have. Thanks for the feedback,Lydia. Maybe I’ll go to T4G 2020 myself to see what’s really up! Thanks for the comment, Lydia. You’re a wealth of knowledge. I would like to read the book “Ministers Wooing.” I’ll see if I can find it. Todd, I had to buy an 8 1/2 x 11 paper back copy online that was a horrible reprint. It’s so interesting how she subtly wrestles with the doctrine. It’s not the focus but it’s there. And when I read about her life and what her father went through it started to all make sense. Just back from my shopping excursion to Amazon! I found the book you mentioned Lydia. The Kindle version is only 99 cents. I am not sure if that is a permanent price or a sale price. Anyway, here is the link for anyone interested in purchasing the book. First thanks for posting this “review” of T4G2018. Interesting that Mahaney was no where to be seen. I guess the group learned though I am sure they really wanted Mahaney around. The other thing about tipping is that a groups stays seated at a restaurant longer than normal they should tip even better since they are taking time that the server could be serving and getting tips from another customer (assuming it is a busy time). A group like this should even make it a point to tell attendees that they should be tipping their servers reasonably well and not give the group and Christianity in general a bad name. As others have said, I am sure it is more the attendees being strapped for money and wanting to spend it on books if the tipping is as bad as some are reporting here. Hi Steve, thanks for your feedback. I simply don’t see how genuinely cash-strapped people could afford to attend T4G at all. It does not offer scholarships or financial aid, to my knowledge. In most cases, the Churches of the Pastors attending the conference are paying for the trip. Presumably, the Pastors get some money for incidentals. To me, the explanation is simple. “Together for the Gospel” only applies to T4G attendees. The rest of us can go to hell. Buying books at this conference is not a necessity. When I travel, I see any number of souvenirs I’d like to purchase for friends and family. However, I don’t do so at the expense of not tipping food servers. My parents raised me to believe that would be wrong. At least sone of these T4G attendees are not genuinely cash-strapped, yet they universally seem to have a reputation for not tipping. In other words, they could buy books and tip, but don’t see the value in tipping hard-working service people. Their failure to tip food servers, many of whom don’t make minimum wage, is a reflection of their priorities and bad manners in general. That’s my take. Others may have a different perspective. I try to remember that ten years ago I was probably as admiring as the fans are now. I would have loved to go to one of these conferences. Now I would not cross the street to hear them. I suppose in a way I am glad for what God exposed with the SGM mess, as it took the pedestals down and took me back to loving the the Lord and bible more than anything else. Thanks, 5Years. I guess there is nothing we can’t learn from. My regret is that I am such a slow learner! Very true Janna. The celebrity “Christian” speakers frequently rail against the internet and watch bloggers. They long for the days when they could get away with anything. If you listen to Thabiti’s video on my blog he stated: “scoffers buy real estate on social media, they just camp out and live there.” This is just another hypocritical cheap shot against bloggers who oppose the celebrity speakers. Truth be told, Thabiti has a much larger presence on the internet than most bloggers I know and judging by his numerous Twitter conversations after his article on MLK, plus several articles he posted after that article attempting to salvage his name, he seems to really be into camping. Well thought-out article. I have to think more about it. As I have written before, I have been in churches over 40 years (with a lot of time off) and it’s still the same old play book action wherever you go, maybe only intensified with things like T4G; taken to new heights. When I think of all the ‘truths’ given out by men from the pulpit who I listened to and believed in wholeheartedly, men who tell you what is the ultimate truth and convey that you need to hear and live by and believe in their words, I should be ashamed of myself. I only have myself to blame. Why does it take so long to see the truth? Why are we so gullible? I believe it is because our hearts are perverse to begin with. We believe such lies because our hearts are not right before God; and in a BIG way. It took me a number of years to wake up, with my life sort of falling apart at one point to begin to really believe God and want to obey Him. So, I am grateful for those ‘hard times’ and grateful that He did not give up on me. I actually see the following as true, as I look back. One, my heart was not right. I really was not devoted to God. Next, even in that condition, God saw a future for me and knew that one day He would be able to bring me out of that. In the mean time, He wanted and did educate me about American Christianity. So he put me in some real good schools. I will not name the churches here. But as I look back, he wanted to educate me; and educate me he has done. So, I don’t look at it as a total waste of life for the time that I was in these churches. In life, you have to go through some hard knocks to learn something deeply. You simply cannot get it from a book or even from another persons own story. And as I said before, I see that my heart was not right toward wanting to serve God faithfully. This is a perfect set up for people being in churches where they have no business being. It’s because they themselves are not right. However, should you be in such a place, that in itself will not stop you from growing. If you begin at some point to be faithful to God, to begin to yearn to please God, He will begin a real relationship between Him and you, and at the same time He will show you what is going on in the church that is not right. He will open your eyes. He will educate you and you can come to the point that you realize and understand without another soul telling you, that it is time for you to ‘get out.’ Which is the place you will ultimately arrive at, if, and that’s a big ‘if,’ you want to know the truth and really start loving and serving God. It’s a sign of real growth and fear of God, and wanting to not do anything that He will not like. And I saw it happen to a lot of people who went to Covenant Life Church, after they had been there for a number of years. They grew and God told them to get out. I just wrote a lot, and if you don’t think it’s worth others reading, Todd, I will not be offended in the least if you remove it. But these are some of my thoughts. Thanks for the comment, Little King. I identify completely with what you have said as I have traveled a similar path.